« #56 Kerosene Hat-Cracker. Richmond and Oregon Hill Continued. This entry was posted on October 1, 2010 at 12:30 am and is filed under Cracker with tags can i take my gun up to heaven?, hollywood cemetary. You can follow any responses to this entry through the RSS 2.0 feed. You can leave a response, or trackback from your own site. Oregon Hill reminds me of the St Johns neighborhood in Portland, OR. While it’s a bit more diverse, in terms of demography and race, it’s similar to Oregon Hill in that a significant percentage of its population lives under the poverty line (23%, according the Wikipedia–the standard for wikiality). There’s a bar in St Johns called Slims, where a secret Cracker show would be awesome. I wonder how many people it holds? This trilogy of Oregon Hill posts is the story of every rock scene from the 1960s onwards. Of course, all the details are different for Haight Ashbury in the 60s, or the Lower East Side in the 70s or dozens of other places, but the essential arc is the same: cheap, transitional housing, proximity to work and gigs, tolerant indifference from the locals. The story about the street fight being broken up by one cop is meaningful, too, since it clearly indicates that despite a certain level of rowdiness Oregon Hill was safe enough for a wobbly musician to walk home late at night with his expensive gear. What makes Oregon Hill such a perfect paradigm–beyond, of course, David’s articulate eyewitness account–is that the street map so clearly illustrates the economic circumstances of the community: near enough to be useful, but separate enough to be left on its own. The area was always populated by outsiders who didn’t see itinerant rock musicians as much different themselves, which is not true of every neighborhood, even down and out ones. 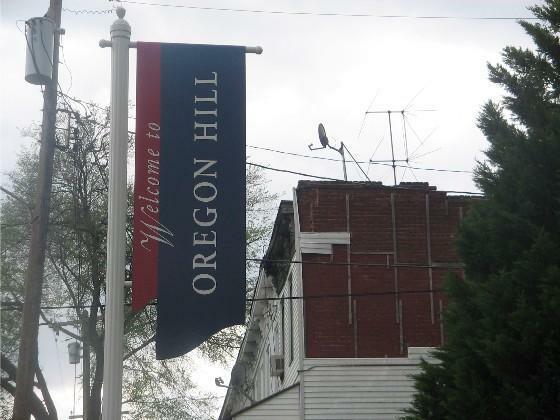 When you see the Oregon Hill flag as the neighborhood gentrifies, its typical to invoke Joni Mitchell and say “you don’t know what you’ve got til its gone.” That may be, but the nature of transitional neighborhoods is that they are in motion and can never remain the same. In this case, it looks like Oregon Hill is heading upwards towards chi-chi, rather than downwards towards a slum, but either way it could never stand still. The more likely prophet here would be former New York Tribune columnist Karl Marx, who famously said “History repeats itself…first as tragedy and then as farce.” As Oregon Hill improves, that will lead inevitably to an Historical Society, then a Street Fair and finally a Heritage Festival. There is plenty of history in the community (as David eloquently described), but the only cultural heritage is a bunch of 80s and 90s rock bands. Sometime around 2030, David and Johnny will get to judge the Cracker karaoke contest (contestants will be using Rock Band 27.0), as the final event before the re-enactment of the Dirt Lady/GWAR match. I’ll meet you all there. That’s no lady, that’s Dirt Woman, man. Regardless of chronology, Dirt Woman was an innovator, and Divine a domesticator. S/he used to show up at occasional punk gigs, invariably grabbing some young guy but the nuts. In the 70s and early 80s, the East Grace end of the now gentrified fan had the same cheap housing as Oregon Hill. It still cracks me up that a friend who became some sort of financier paid top dollar for a National Register of Historic Places rowhouse where in 1985 you could still buy heroin. That part is not on the official history. Thanks for this and the other Orre-GONE Hill entries. On October 23, a historical society is offering a tour of Hollywood Cemetery on segways. What will the Oregon hillbillies make of that?